KLAMATH and WESTERN RAILROAD Inc.
1. ALL TRAINS MUST HAVE BOTH AN ENGINEER AND A CONDUCTOR. This specifically excludes radio controlled trains. The minimum age for an engineer or conductor is seven, the age of reason. The minimum age for an engineer or conductor on a train hauling the public is eighteen. 2. SEVEN MILES PER HOUR MAXIMUM SPEED EQUALS TEN SECONDS BETWEEN MILEPOSTS. Exceptions are posted trackside. 3. 210' MINIMUM SEPARATION BETWEEN TRAINS EQUALS TWO MILEPOST LENGTHS TO THE END OF THE NEXT TRAIN. The absence of signal blocks means that safety requires separation between trains. 4. ALL CONDUCTORS TO BE EQUIPPED WITH A RED FLAG. Minimum flag size is 12" x 12". 5. CONDUCTOR TO FLAG TWO MILEPOST LENGTHS (210') BEHIND ANY STOPPED TRAIN. This rule probably prevents more accidents than all of the other rules combined. 6. SAFETY CHAINS OR DRAWBARS REQUIRED BETWEEN ALL CARS. Some grades are more than a mile long. This rule prevents runaway cars. 7. ALL TRAINS TO HAVE AN FRS RADIO TUNED TO CHANNEL 10, on Public Operation days the FRS channel for the K & W is Channel 6. Someday, one of these radios will save the life of someone who has a heart attack while far away from Central Station. 8. SOUND HORN OR WHISTLE (--- --- - ------) AT W SIGN. These signs are located 60' before the track crosses roads or other tracks. 9. SPARK ARRESTORS & ASHPANS REQUIRED ON ALL COAL, OIL & WOOD BURNERS. The summer fire danger in Klamath County is always "High" and often "Extreme." 10. DROP A GREEN BLOCK AT ANY DERAILMENT LOCATION. Not only does this tell track crews where problems are, it warns the next train that there is a track problem. Please place the block to right hand side of the right-of-way. Place it far enough away from the running track so as to not cause additional problems. 11. UPON ENTERING ANY SIDING, RETURN SWITCH THROWS TO BE LINED FOR MAIN LINE. This is particularly important when the next train may have an engineer on his or her first trip on the Klamath and Western track. 12. WHITE HEADLIGHT MOUNTED ON FRONT OF ENGINE. Steam engines may need battery-powered headlights. 13. RED TAILLIGHT MOUNTED ON REAR OF LAST CAR. The flashing lights sold in bicycle stores are a popular way of meeting this requirement. 14. CONDUCTOR TO USE FLASHLIGHT TO FLAG TWO MILEPOSTS (210') BEHIND ANY STOPPED TRAIN. 15. 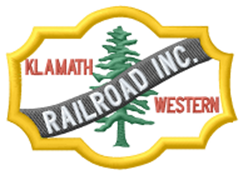 If you wish to haul the public on the Klamath and Western railroad you MUST be a member of the Klamath and Western Railroad Inc. and be 18 years old or older. This includes engineers and conductors. No Exceptions. 16. Conductor must give safety speech to riders before departing passenger loading area. 17. Passenger trains longer than 100 feet must have a second conductor centrally located on train. 18. Each passenger train shall maintain a log sheet for each days operation.